I’m easily bored. Put nail varnish on me and three days later, I want a change. This little (well loved) bottle of top coat makes it so much easier to switch polish every time the whim takes you. I heard lots about Seche Vite before eventually buying it and it’s a hugely hyped product, but in my opinion, rightly so. It actually does (most of!) what it says it will do, costs under a tenner and is worth every penny for how much time it saves. It’s not perfect and it has it’s downsides but it’s still my new best pal. 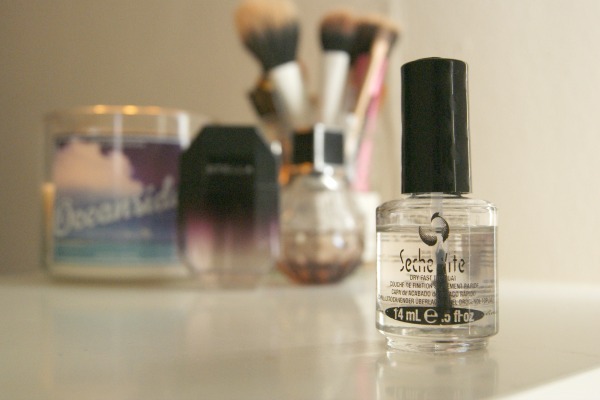 Seche Vite will dry your nail varnish solid in a matter of minutes. You paint your nails as normal and once you have painted your final coat of colour, you immediately apply Seche Vite whilst your top coat of colour is still wet. Painting a wet coat of bright colour with a clear varnish freaked me out no end at first – “the colour, the colour’s getting in…?!”. That’s all part of the magic though, because somehow it doesn’t make the clear liquid murky, as long as you have a good drop of Seche Vite on the end of the brush. Within a minute or two, your nails are touch dry and a little longer and they are rock solid. Winner! I’ve tried a few other quick drying products like drops and sprays and have liked most of them, but this is by far the best of the bunch and the most trustworthy. What’s better is that it leaves your polish with a gel like gloss and I think that’s what gives it the edge over some others. This smells pretty potent, as you might expect for super strong polish, but it’s a bit too much if you tend to paint your nails on the go. Try to use this on a packed commuter train and you could be one unpopular girl. It also claims to make your manicure last longer, which I didn’t feel that it did. You can get the matching base coat, which I don’t have, so perhaps you need to use both at once for the full effect, but my manicure chipped as quickly as it normally would. I’ve also read about peeling problems, but I haven’t experienced anything like that. Shrinkage is also a problem, although it has only happened to me occasionally. As the top coat dries, it can shrink the colour, pulling it back and making it look like the tip of your nail varnish has worn away. I’ve only noticed this a couple of times and even then it only appears on one nail – I can live with that. The best (read: most dangerous) thing about this is it allows you to change your polish far more frequently, so I’ll definitely repurchase this one when it’s empty.